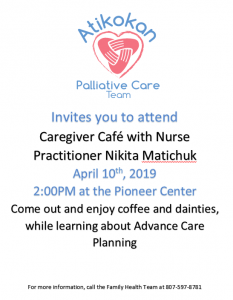 The Atikokan Palliative Care team invites you to attend a: Caregiver Cafe with Nurse Practitioner Nikita Matichuk April 10, 2019 | 2:00PM at the Pioneer Center Come out and enjoy coffee and dainties, while learning about Advance Care Planning. Fore more information, please call the Family Health Team at 807-597-8781. 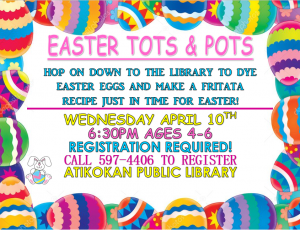 Hop on down to the library to dye some Easter eggs and make a fritata recipe just in time for Easter! Wednesday April 10, 2019 at 6:30 pm. Ages 4-6. Register required. Please cal 807-597-4406.